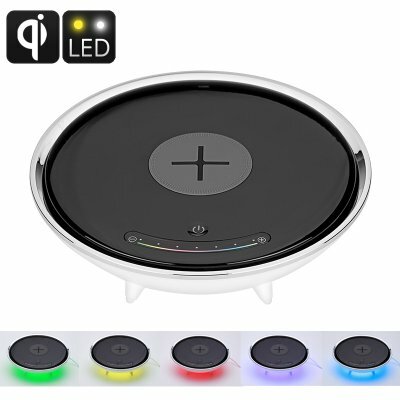 Successfully Added Wireless Charging LED Color Light - Millions Of Colors, Qi-Enabled Wireless Charging, Smart Home Accessory to your Shopping Cart. With its modern design this beautiful table light does not only spice up your interior, it also wirelessly charges all your QI-enabled devices in the blink of an eye and lets you choose in between millions of different light colors. No matter your mood - simply switch in between the countless number of different colors the stylish U1 table lamp has to offer and create the perfect atmosphere. By simply turning the integrated color wheel of this LED table light, you can easily select any color and brightness you like, creating the ultimate mood lighting. Whether you spent a romantic evening at home with the missus and want to enlighten the room in passionate red, or simply like to enjoy some smooth yellow light while reading your favorite book before heading off to bed – with this LED color light lamp you are guaranteed to find the right color lighting fit for any occasion. Besides functioning as a regular LED color light this beautiful smart home accessory is capable of a whole lot more. Why not charge your phone while enjoying the unique ambiance created by this QI-enabled wireless charging table light? By simply placing your Smartphone or any other Qi-enabled device on top of this remarkable color light it functions as a wireless power bank, allowing you to charge your smartphone in no time. No more worries about drained batteries when leaving your home – with this Qi-enabled table light you can be assured that you always have to juice to stay connected to your friends and loved ones. Its compact, round, and sleek design make this LED color light a stunning little accessory that fits perfectly in any modern household. Whether you place it in the bedroom, living room, or dining room, this remarkable wireless charging table light is an ideal smart home gadget that is guaranteed to set a mood and atmosphere that will perfectly suit any occasion. This wireless charging color lamp comes with 12 months warranty. Brought to you by the leader in electronic devices as well as wholesale LED color lights, Chinavasion..